AXIS POWERS is a Swedish old school death metal band featuring members of SUICIDAL<?xml:namespace prefix = o ns = "urn:schemas-microsoft-com:office:office" /> WINDS. 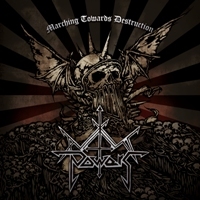 ‘Marching towards Destruction’ is the title of their second full-length album, if I’m correct. Dismember, early Bloodbath and Necrophobic comes to mind when this album rotates in my player but sadly almost nothing really stands out. The drums sound weak and the guitar riffs are quite boring in my humble opinion. There are only 2 songs that have rocked my world, namely the quite entertaining “Brutal War” and “Forward March”. The rest of the songs are not bad by any means but not above average in my opinion. The music is a bit repetitive and the somehow weak production does not help the band any further. somewhere else for their daily shot of death metal.